I like to make quick and easy meals during the week. 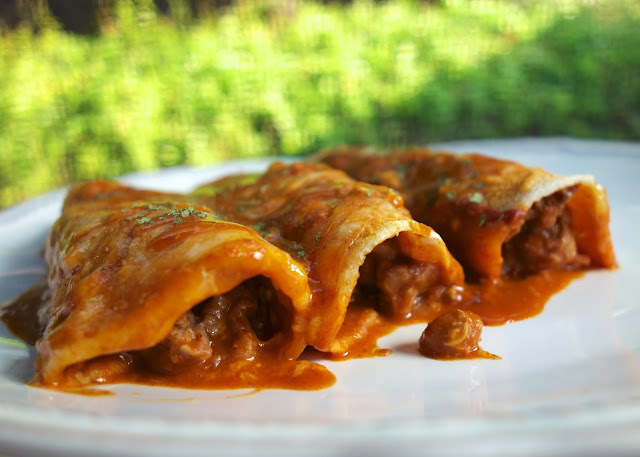 These Beef and Bean Enchiladas truly fit the bill! They are snap to make and taste great. They were even good reheated for lunch the next day. I served this with some Mexican rice and chips and salsa. Feel free to top the enchiladas with some sour cream, tomatoes and lettuce if desired. You could also add a can of Rotel tomatoes or a cup of chunky salsa to the meat mixture if you wanted to kick these up a notch. I am going to try that next time! YUM! 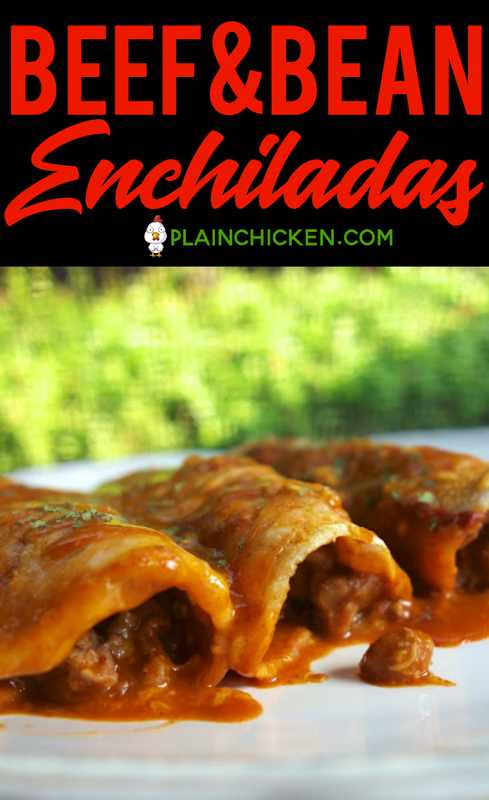 These enchiladas could easily be made ahead of time and refrigerated (or frozen) until ready to be baked. I love easy meals like this! reheat oven to 350ºF. Lightly spray a 9x13-inch pan with cooking spray. In a large skillet, brown ground beef. Drain fat. Return meat to skillet. Stir in onion flakes, refried beans and taco seasoning. Cook over low heat until thoroughly heated. Set aside. Heat enchilada sauce in saucepan over medium heat. Pour one cup of sauce in bottom of 9x13-inch pan. Wrap tortillas in a wet paper towel. Microwave for 45-60 seconds, until tortillas are soft. 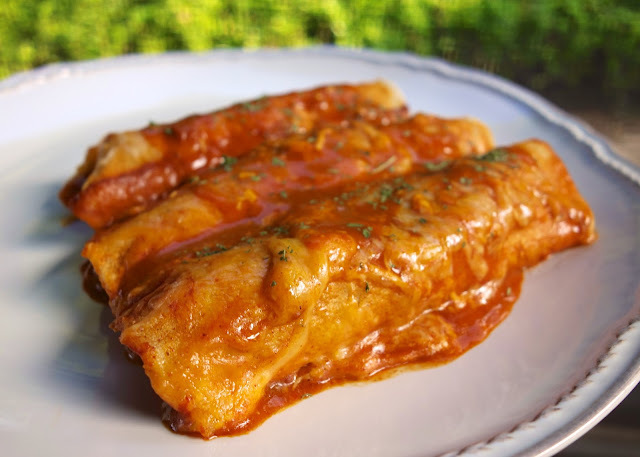 Brush tortillas with enchilada sauce on both sides. Spoon approximately 1/3 cup meat mixture down center of each tortilla. Top with one tablespoon of cheese. Roll up tortilla and place seam side down in 9x13-inch pan. Repeat with remaining tortillas. Pour remaining sauce over tortillas. Top with remaining cheese. Bake for 15-20 minutes, until cheese is melted and enchiladas are heated thoroughly. My mom used to make a similar dish but made it even quicker by making it a casserole. She would dip the tortillas in the enchilada sauce & lay them flat in the bottom of the casserole dish. She would put 6-8 of them. Then she would spread the meat all over & top with cheese. Then take more tortillas dipped in sauce & cover the meat & cheese. She would pour remaining sauce over this & top with more cheese. Once it had baked, she would cut into squares & serve. Same exact flavored but a lot easier than rolling them up individually. It's great when quick and easy producing such good looking results. G0dsgrl71 - that is a GREAT idea! I will try that next time. I love all of your quick and easy meals...they have saved many a weeknight dinner for me :) these look fantastic! 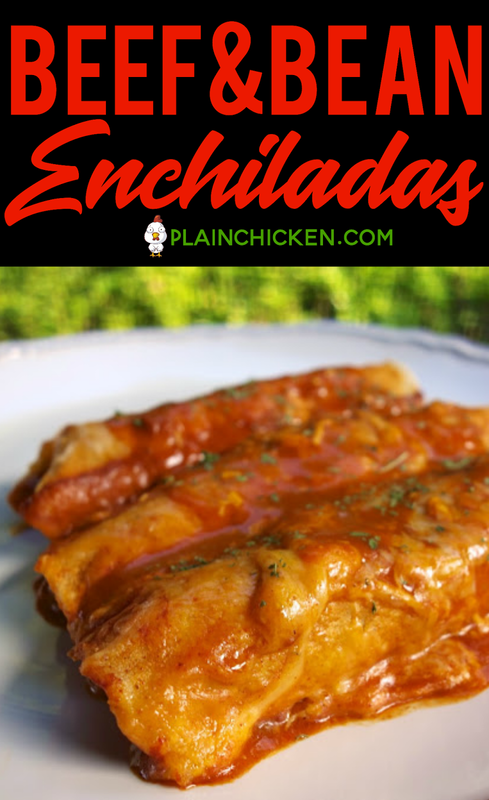 What brand of enchilada sauce do you usually use? I tried a version of this tonight and it was soo delicious! I used the suggestion of making it casserole style. I followed this recipe except I added in a black bean, corn, and Rotel salsa I had leftover, and had the refried beans on the side. It was amazing! We had these on Saturday night and they were a hit with my family! Thank you for the yummy recipe. I may try them as a casserole another time too!